When was the last time you got away with the girls? 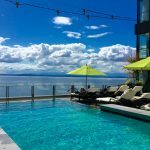 Bainbridge Island, Washington is the perfect destination for a girlfriends weekend getaway. 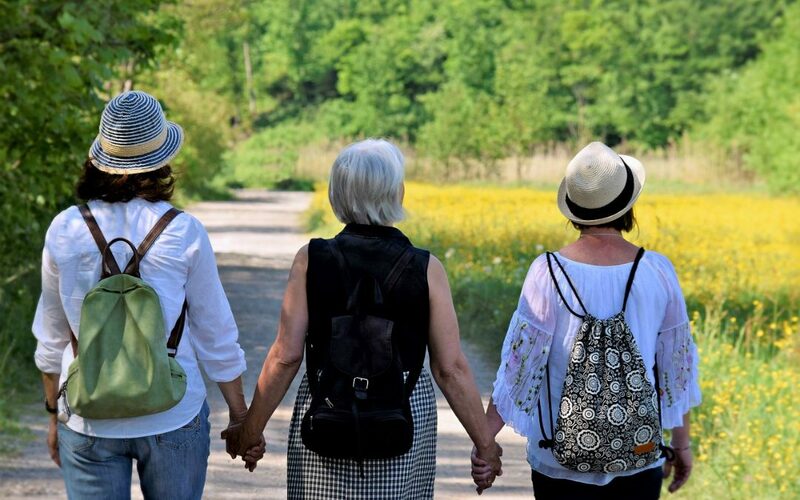 It’s easy, it has luxurious amenities that feel like a special treat, beautiful outdoors for a rejuvenating dose of nature, and it’s accessible via ferry which makes it an adventure. 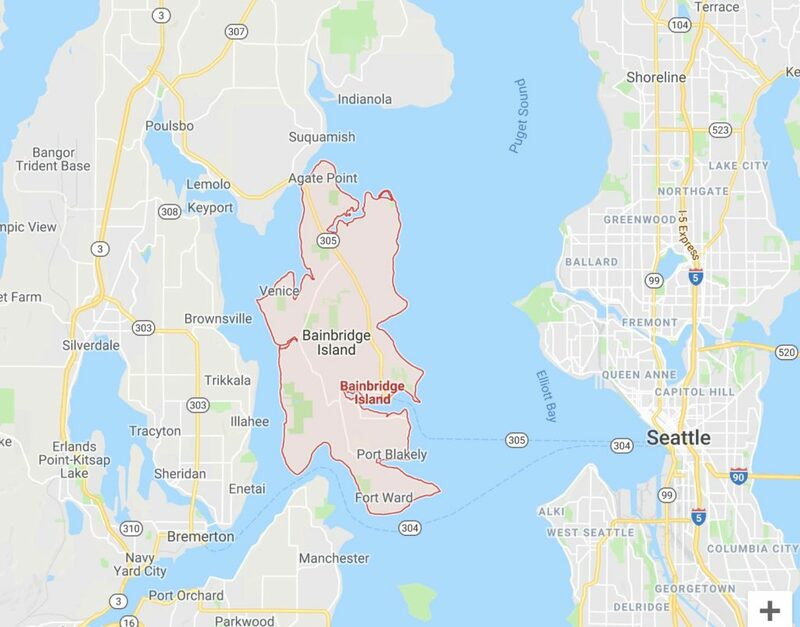 Bainbridge Island is located in the Puget Sound, across from Seattle, with the Olympic Mountains to the west and Mount Rainier to the south. The scenery is gorgeous. 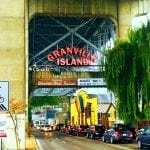 A population of about 24K people take great care of the 28 square mile island–it’s immaculate with beautiful architecture, pristine forests, and quaint houses. 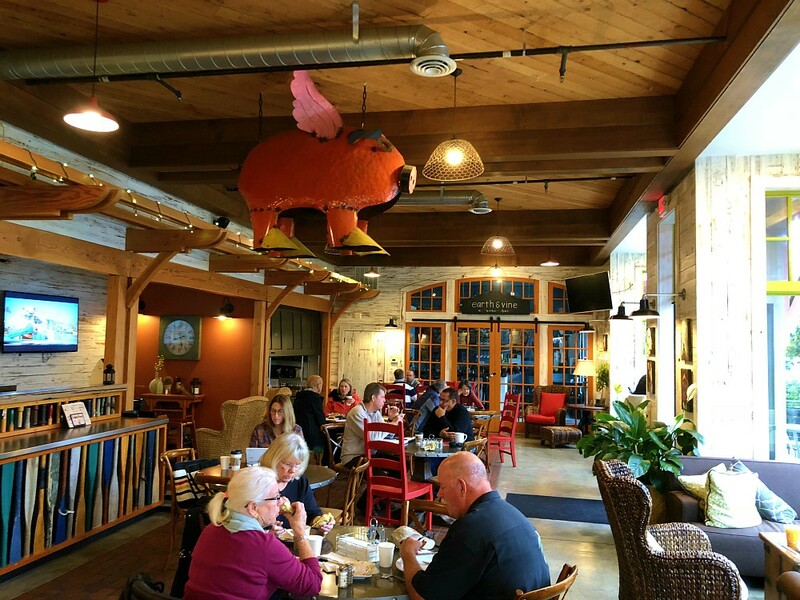 The island is big on Local with its own farms, organic distillery, brewery and wineries. 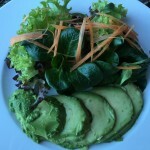 When you go to a restaurant, you’ll find much of the food was either grown there, or sourced as locally as possible. It’s exciting to be able to experience what the island has to offer by eating food and drinking beverages created right there. 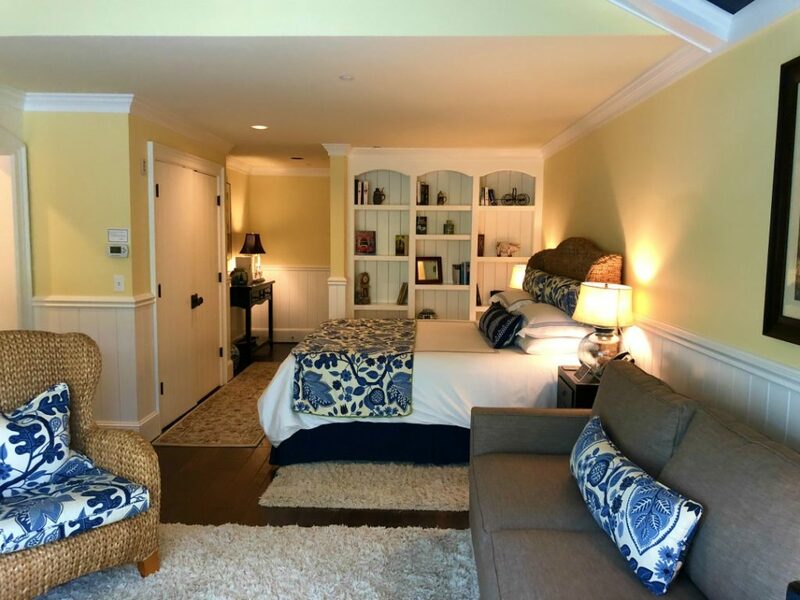 The Inn at Pleasant Beach is the place to stay on Bainbridge Island. It ranks as one of my favorite hotels, and certainly one of the most charming I’ve ever seen. You feel like you are staying at your friend’s beach house. Your close friend, because it’s very personalized and brimming with character. A cozy seating area in front of the stone fireplace sits opposite the sleeper sofa, providing a nice place to sit a visit. This room is quite comfortable for two people, and so pleasing. Look at all those patterns and textures! Isn’t that fabulous design? I don’t think I’ve ever stayed in a hotel with so many different lamps and interesting accessories. Complimentary wifi, water view and dog friendly rooms, and a seasonal pool that I would love to enjoy (it shuts down in September) all contribute to the lovely amenities. 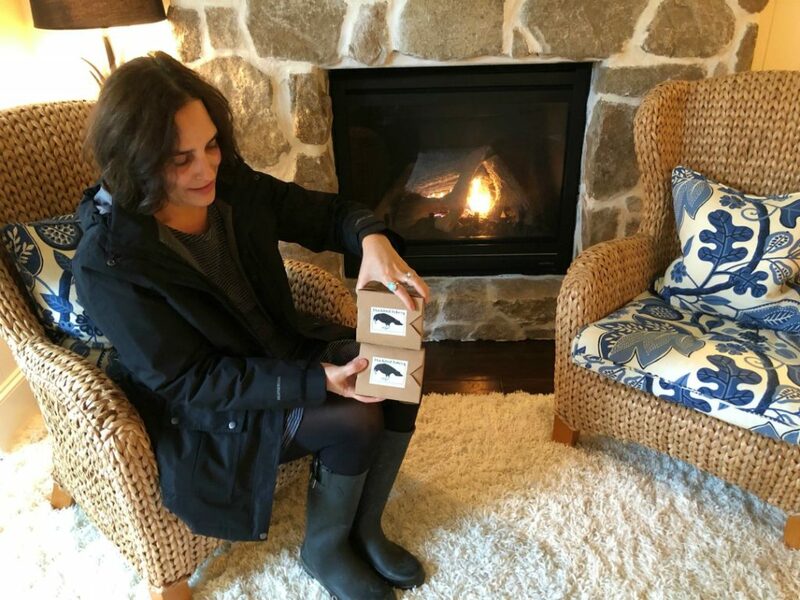 The Inn is part of Pleasant Beach Village, which is adorable and includes an arthouse movie theater, coffee shop, farm shop with fresh local farm goods, and other boutiques and restaurants. We loved it so much we are already talking about wanting to go back next summer. 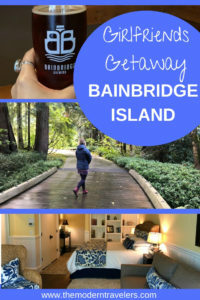 If you want to be active, and get out on the water, Bainbridge Island offers kayaking with Exotic Auquatics, and sailing with Sail Bainbridge. There are plenty of trails for hiking, or you can stroll through downtown or Bloedel Reserve. When you’re ready for refueling, there are several top notch restaurants where foodies can get their fix. 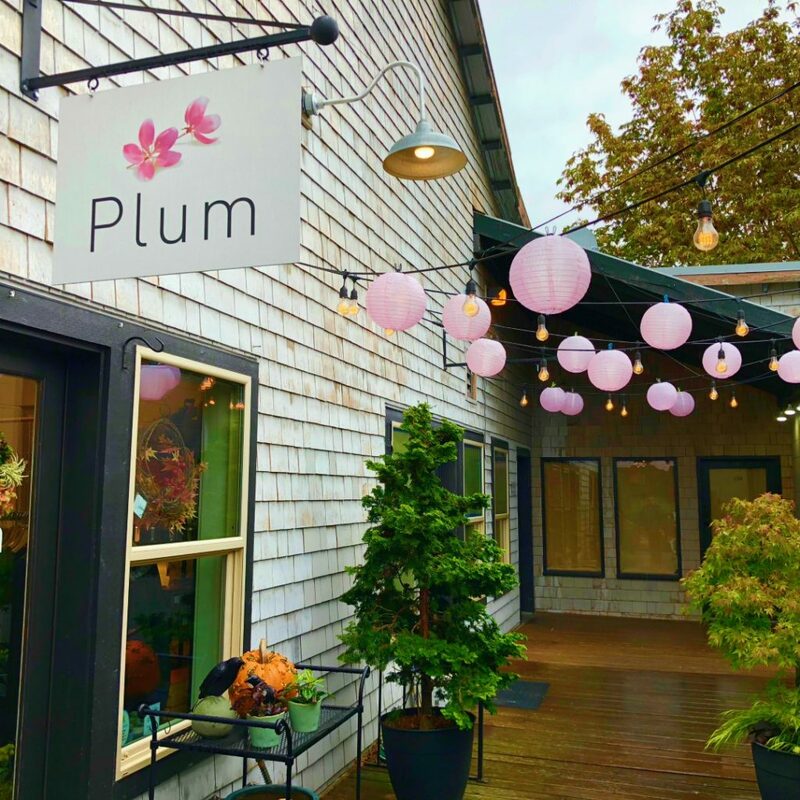 Downtown Bainbridge Island has delightful shops, and they even host a Girlfriends Day Out Shopping Day in May with fun giveaways. You’ll find locally made goods, locally grown food, and artwork by Washington artists. 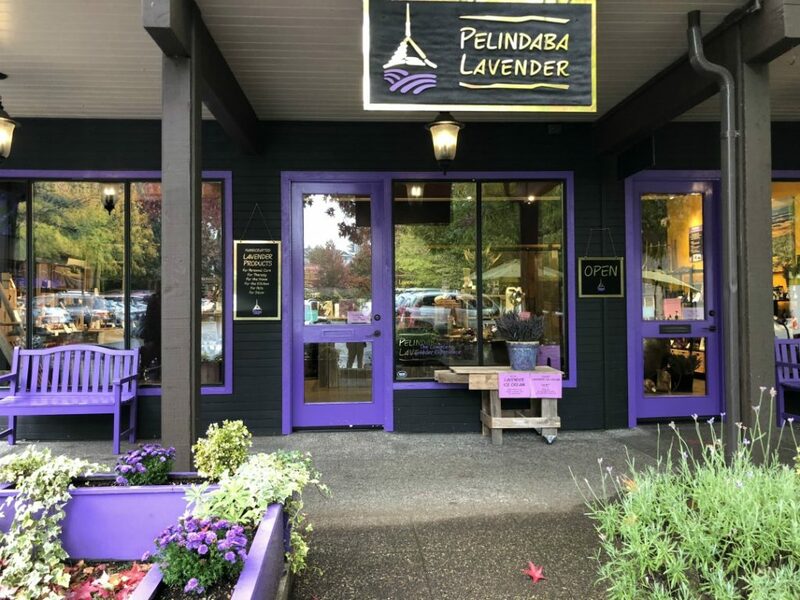 Pelindaba Lavender grows organic lavender on the San Juan Islands and sells hand crafted oils and other lavender products, Bon Bon Candies has yummy homemade Salted Caramel Chocolates, and there’s a shop called The Traveler where you can pick up travel-size items you might have forgotten, or luggage and gear for a bigger trip. Just 10 minutes from downtown on the north end of the island, you’ll find Bloedel Reserve, a 150-acre public garden. 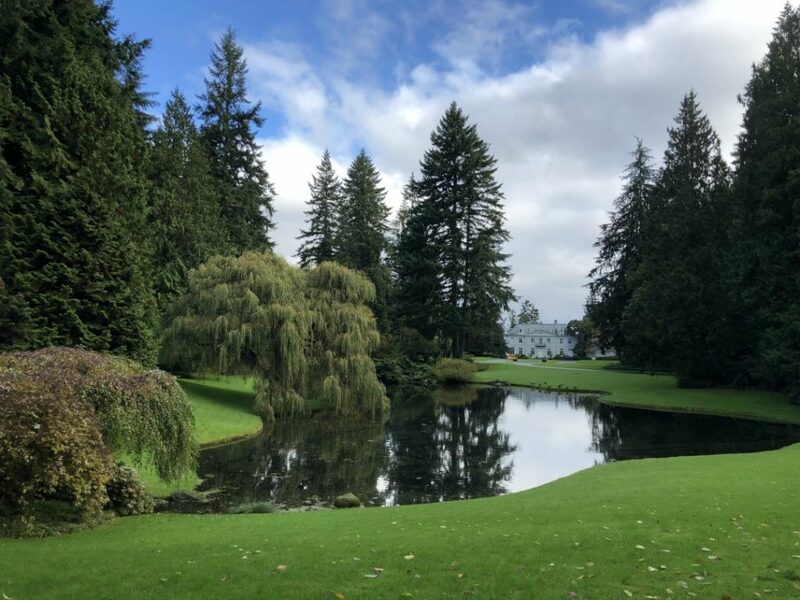 Once the estate of Prentice and Virginia Bloedel, the reserve was inspired by Japanese gardens, and aims to preserve nature and provide a tranquil oasis for the community. Bloedel was a pioneer in the conservation moment and understood the therapeutic benefits and downright necessity of time spent immersed in nature. Trails are fragrant with the sweet, piney smell of spruce trees, which is quintessential Pacific Northwest and one of my favorite scents on earth. 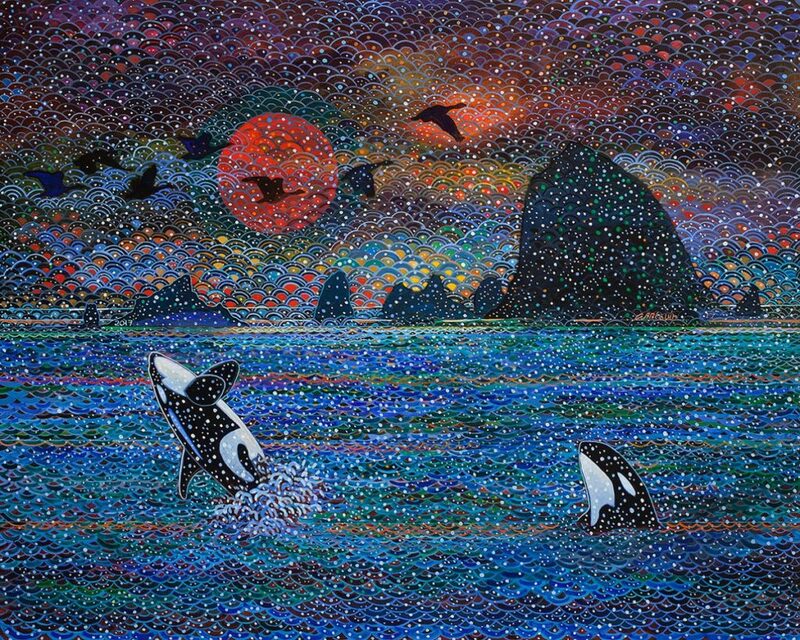 Bainbridge Island Museum of Art (BIMA) showcases works by local artists and is free to visit, with a generous 15-20 exhibitions per year. The museum considers itself the island’s cultural living room, and also has a bistro to grab a bite. For a more historical perspective, visit Bainbridge Island Historical Museum, and for a special focus on Native American History, check out the Suquamish Tribal Museum and Chief Seattle’s grave located on the north end of the island. We were there on a Monday, and some of the restaurants we wanted to try (Marché, Hitchcock) were closed. This ended up being a good thing because we ate at our hotel’s restaurant, The Beach House and it was wonderful. I would recommend this even if you are not staying at the hotel. 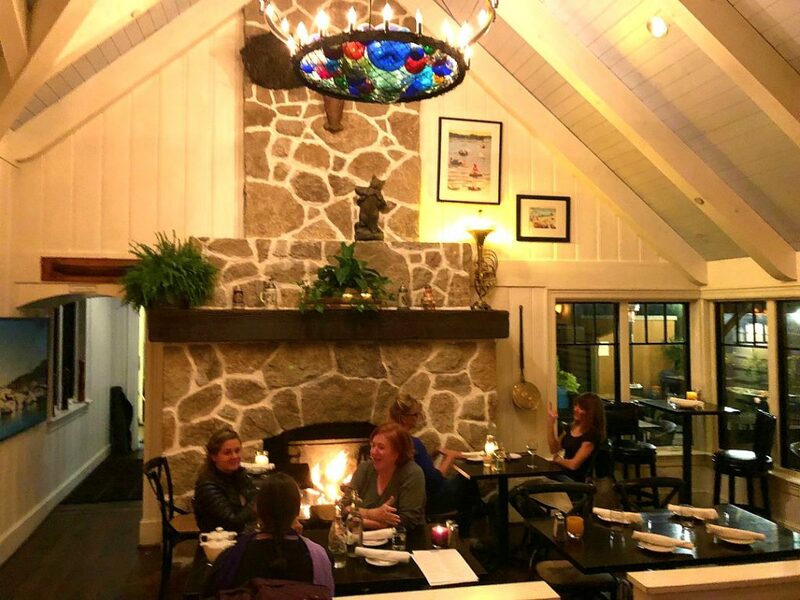 The atmosphere is cozy with a stone fireplace, tall shiplap ceilings, a fabulous chandelier with glass sea floats, dim lighting, and great views. The food was delicious. We really weren’t expecting such high quality food like Charred Romanesco with Miso and Parmesan, Heirloom Carrots with Buttermilk Dressing and Pecans, and Green Salad with Goat Cheese and Honey which were all excellent and nourishing. Portions were large and plenty to share. 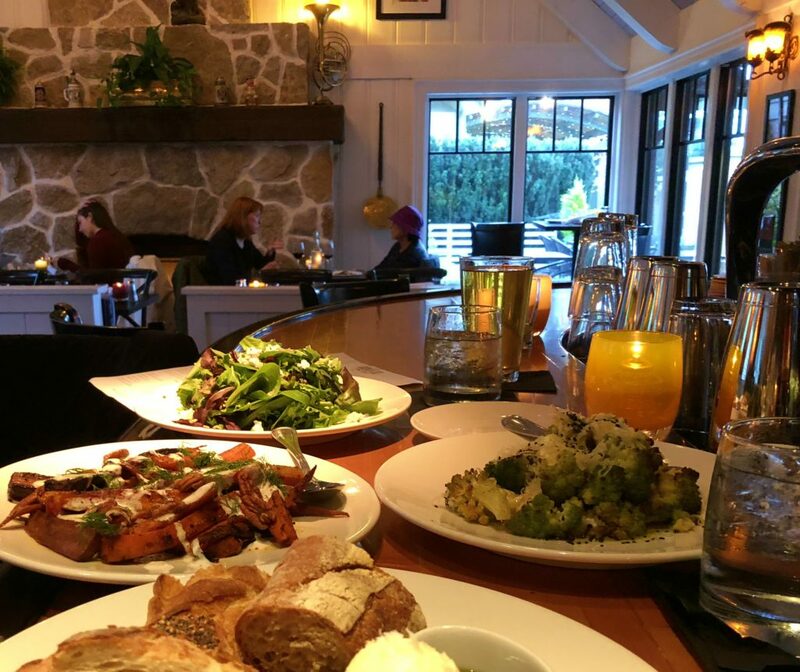 Two places on Bainbridge Island that come highly recommended for wood fired pizza are Bene and Brucciato. 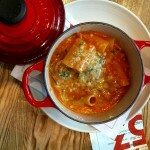 Bene was closed and we didn’t get to try it on this trip, but we did get to eat at Brucciato. Located in an old hardware store, it has an industrial ambiance, huge salads and Neapolitan wood fired pizza served up with scissors. 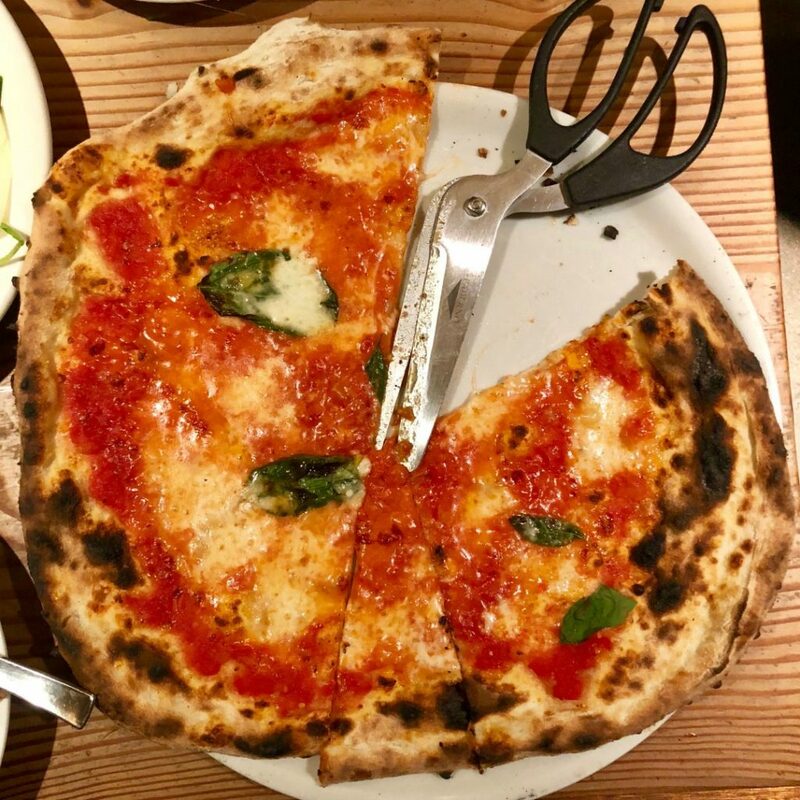 The Margherita Pizza is simple, with good sauce and crispy dough. Blackbird Bakery is a family owned and run bakery with a wide variety of baked goods, a vegetarian lunch menu, friendly people, and a cute atmosphere. They are famous for their thick sliced toast and jam, but you really should taste the Blackberry Scones just loaded with berries and lightly glazed on top. They also have festive seasonal sugar cookies to bring home to the kids like cat skeletons, monsters and pumpkins. 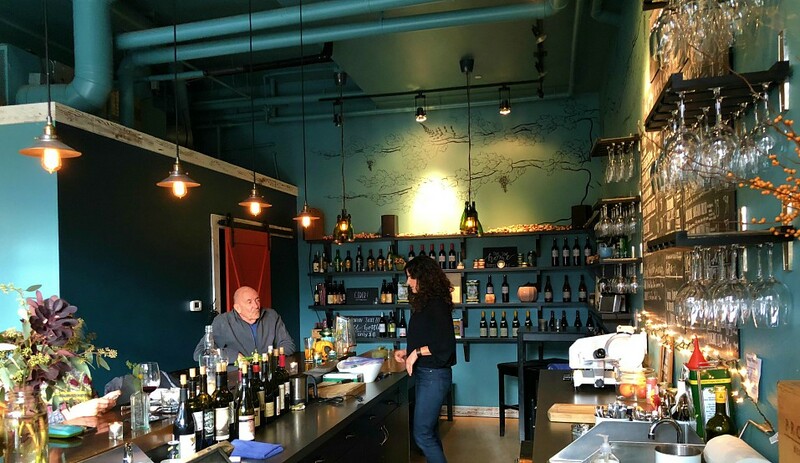 Bainbridge Island has seven wineries and several wine bars. Earth & Vine Wine Bar is just below The Inn at Pleasant Beach, and makes a great place to sample some local wine and ciders. I had a lovely cider called Glow from Alpenfire Cidery in Port Townsend. I’m not a wine person, but I love a dry organic cider and Glow might have just been the best cider I’ve ever tasted. Earth & Vine has a welcoming, community ethos and an engaged (and engaging) owner who loves her job and that’s really nice to be around. 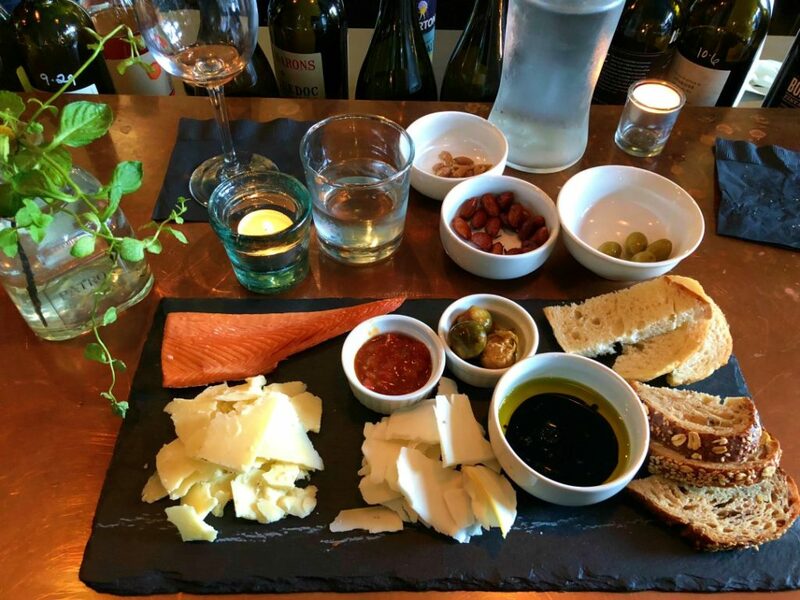 We had a fabulous Charcuterie Platter that included freshly caught wild salmon, bread from local bakery Pane D’Amore, creamy Benning Goat Cheese, and Seattle’s classic Beechers White Cheddar. 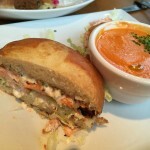 We stopped at Earth & Vine after checking into our hotel room, and it was the perfect introduction to the area. 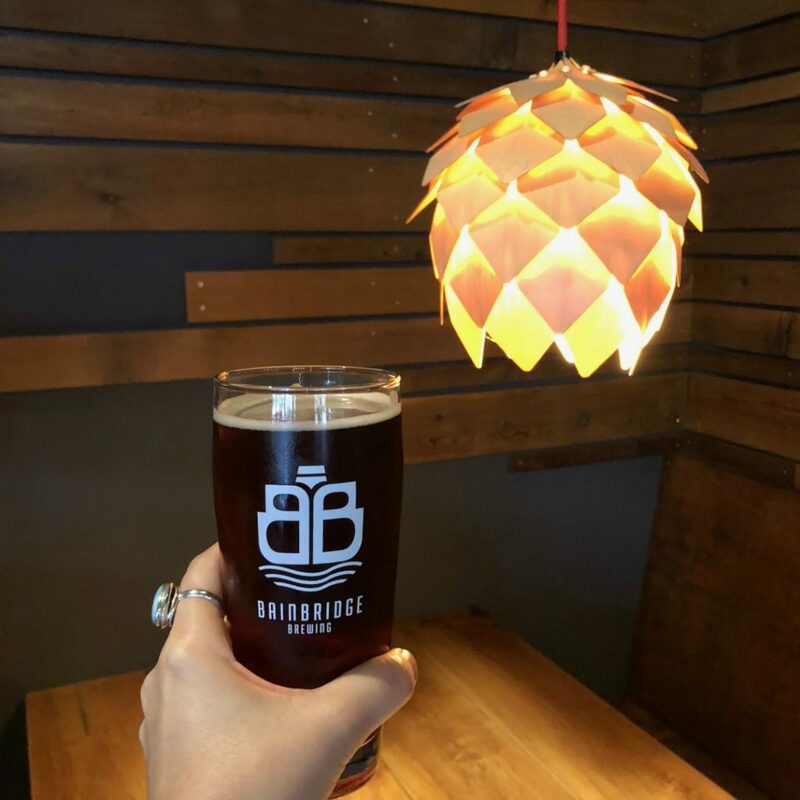 Bainbridge Ale House is the newest location for Bainbridge Brewing, situated conveniently near the ferry. It has a modern, comfortable atmosphere and wonderful Pumpkin Ale made from pumpkins harvested on the island. We hung out for a little while on a rainy day playing Scrabble in a cozy booth illuminated with a hops lamp. 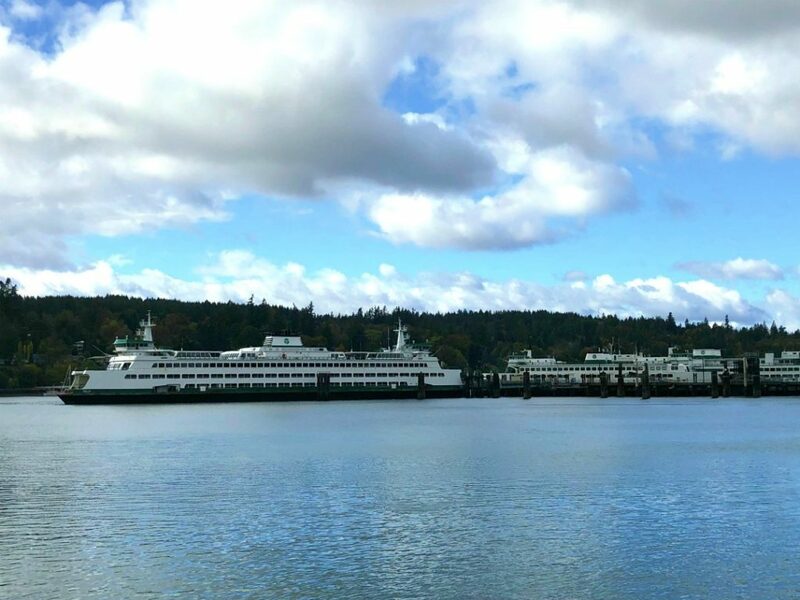 Look at the Bainbridge Brewing logo–it’s a hops design too, and it’s also a ferry. 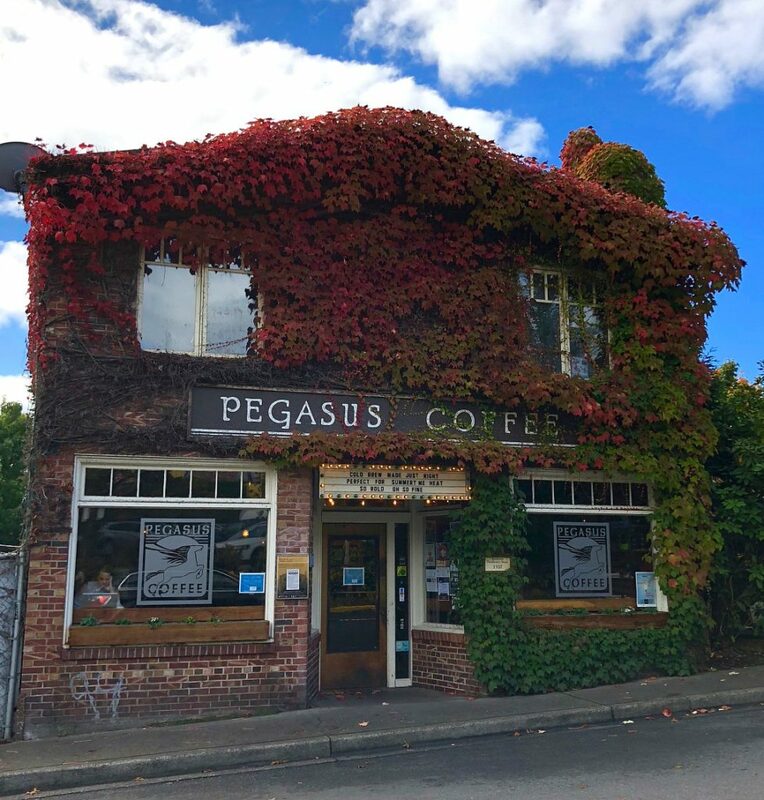 There are several local coffee options on Bainbridge Island. 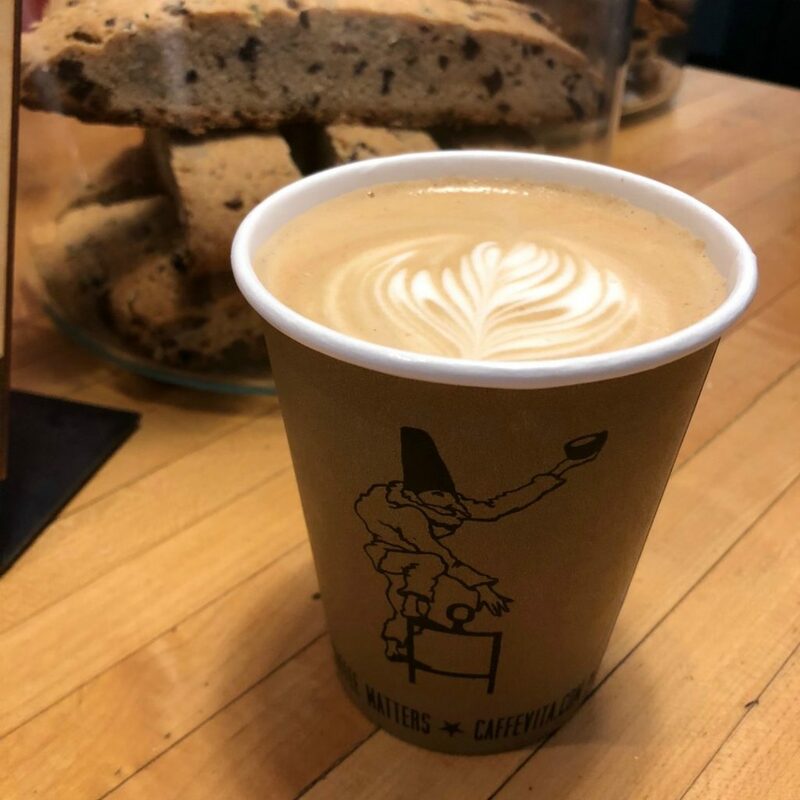 Head to the ivied Pegasus Coffee Shop for java made with locally roasted beans. Pegasus is near the ferry, and they have baked goods you can grab as last minute munchies to eat on the go. Hitchcock Deli is famous for their coffee and sandwiches, but I think their Peanut Butter Chocolate Chip cookies are even better, baked with fresh, locally made peanut butter. My friend had the beet salad and loved it. Hitchcock has a more upscale restaurant next door (closed on Mondays) if you’d like something a little fancier. If you are staying at the Inn at Pleasant Beach, there’s a cafe in the village just below the hotel. 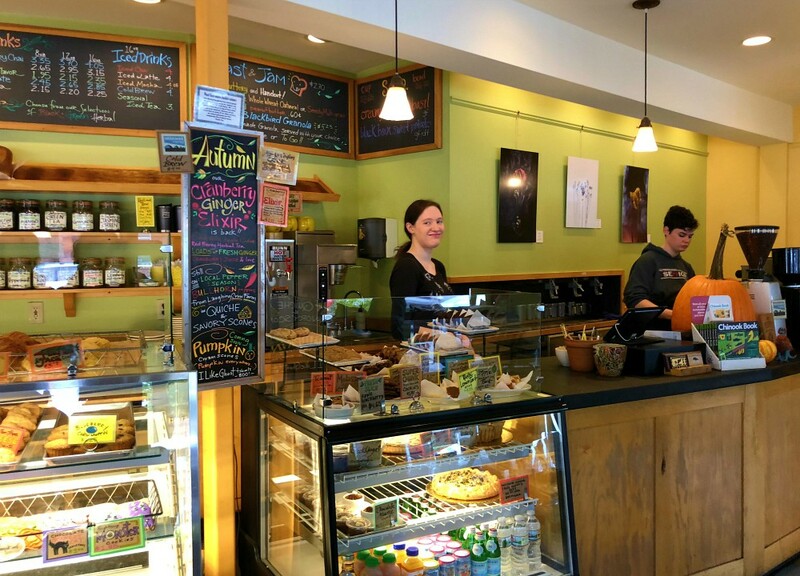 Marketplace serves up organic coffee drinks, deli food, and sweet treats. See the flying pig? There’s a metal goat on the roof of the Manor House at the Inn–the whole village here is brimming with whimsical art. You can take a ferry to Bainbridge Island from Seattle, it takes about a half an hour and it’s only $15 for two people and a car. You can also walk on the ferry. Downtown is completely walkable, though some things, like Pleasant Beach Village and Bloedel Reserve are reachable by Uber. Yes, Bainbridge Island has Uber! Try to schedule your trip so that you are not there on a Monday and have more options for dining and activities. Bainbridge Island is a little more expensive than mainland but this is typical for the islands. Wear layers and bring a rain jacket. 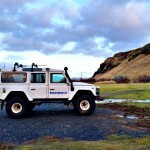 You’ll want at least one full day to explore the island. 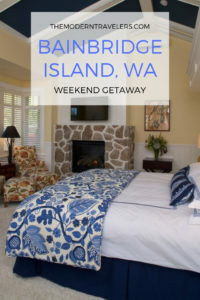 Head over to Visit Bainbridge to plan your getaway. We were guests of Visit Bainbridge, opinions are my own. It looks absolutely perfect! I’ve been feel the pull of going somewhere with lots of trees, greenery, and of course yummy food! I think you’d love Bainbridge Island!